A quick look around here will tell you I've made some changes. It's what I do. Change things. I know it confuses some people, and upsets others. But as the saying goes, If nothing ever changed, there would be no butterflies. I was on the verge of ending this particular blog, thinking it had served it's purpose, but Lauren talked me out of it, reminding me that everything I do is part of the journey, part of the long way home. She's right, the little smartie. And what I figured out is that the blog is the blog, and the beads are the beads, and each one needs its own home. So I built a new website for the beads, and moved them to their new digs over the weekend. The website address is, as always, www.kimmiles.com. The BeadShop is linked from there on its own little tab that takes you straight to the BigCartel shop I've been using all along. That part didn't really change at all, but the route to it did change slightly. You'll figure it out, I have no doubt. I have about two more weeks before I completely change gears and leave for a month-long trip to Seattle to go to the Vegan Fusion Cooking Immersion. I'm so excited I can hardly sit still long enough to make beads. I'll get some done this week though, and next week too... I think. I have a few ideas floating around in my bead-brain. One of them is a beautiful bug I saw a picture of yesterday. I'm not sure how it will translate in glass, but it seems promising. It's a snowy morning, and I have a run to do, and a studio to warm up. I'm looking forward to some changes in those two areas too. Little by little I get stronger and build stamina, but I literally dream of being fast and light on my feet. I know what it feels like, and I'm impatient to get there. As for the studio, it's cold and dark and generally unpleasant, so I think I'll move it out to the little guest casita this summer, where it will be a way from the house, and where I'll have a new view of the world as I work. Ideally I'd move it up to the roof, but the cost and time involved have put that out of the running for now. The casita is adorable and unused. I fear it feels unloved, but... I can change that. So here we are. Or here I am anyway. I feel like I just finished a big spring cleaning, which clears my head too. Moving on, here we go, ready for what changes next. 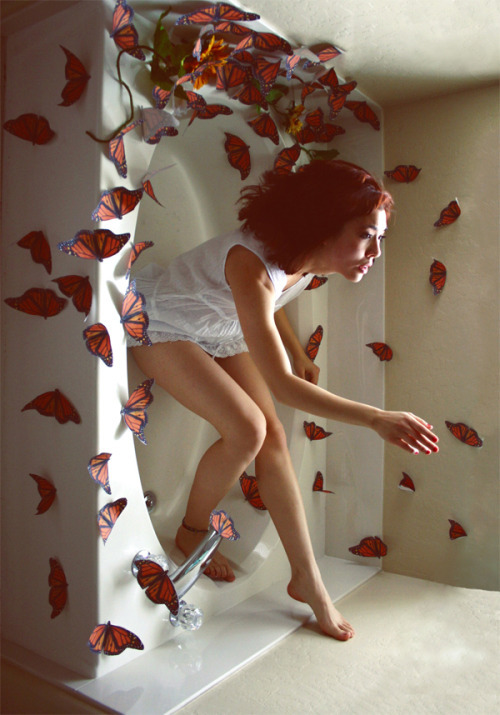 And I trust there will be butterflies. No butterflies seen yet, but the birds are making up for that :). I'm so glad Lauren convinced you to keep this blog. Life is more about the journey and the people, places and challenges we encounter along the way. This blog is a great example. Even if we're in the same physical location, what we see and experience change all the time. And I'm all for figurative or literal 'Spring Cleaning' - it's another wonderful opportunity to change the view, so to speak.